The Raven-TA is the Time-Aligned version of the Raven. In order to do this, I replaced the tweeter with a Peerless H26TG45-06. As I had hoped, this brought the acoustic centers of the Dayton RS180s and the Peerless H26TG45 to the correct displacement for time-alignment. Fig 1 – Peerless H26TG45-06 RAW and High Pass Response. No smoothing applied. I have never used this tweeter before so it is with a bit of apprehension working with it. I was relieved when I made the RAW measurement (Black Plot). Due to the nature of waveguide, the roll-off below 2kHz shows no diffraction from the front panel. There are however, two notches, one at 2.5kHz and the other at 10kHz. This is caused by surface mounting of the H26TG45. Once I flush mount the tweeter, they’ll smoothen out. The Red plot is with a High Pass filter. This is a beautiful response. I do not anticipate any issues crossing with the Dayton RS180s. Fig 2 – Dayton RS180s Low Pass withPeerless H26TG45-06 High Pass Responses. The Blue plot is of the Dayton RS180s with a Low Pass filter. 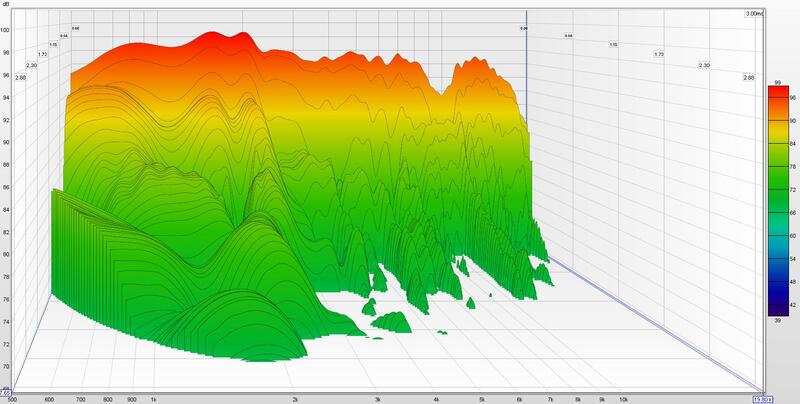 The Red plot is of the Peerless H26TG45-06 with a High Pass network. Acoustically, they are crossing at about 2.7kHz. The H26TG45-06 should be very comfortable at this frequency. Fig 3 is the response of the Raven-TA with the H26TG45-06 wired in reversed phase. What resulted is an incredible null of almost -40dB deep. Fig 4 shows the arrival time of the RS180s and the H26TG45 tweeter. The Green plot is the RS180s woofer with it’s Low Pass filter whereas the Red plot is of the H26TG45 tweeter with it’s High Pass filter. It is clear that the two tips coincide exactly. This is visual proof that the sound from the woofer arrived at the same time as the tweeter. The readouts below the plot verified the time alignment as both the woofer and tweeter registered the same delay of 0.56ms from an Acoustic reference, meaning both sounds reach the microphone at the same time. Measurements courtesy of Room EQ Wizard (REW). Fig 5 – Raven-TA Response with Peerless H26TG45-06 wired in-phase. No smoothing applied. Response below 500Hz are in nearfield. The Raven-TA response is spectacular. It doesn’t deviate more than +/- 3dB all the way up to 15kHz, beyond which it rolls off naturally. The Raven-TA harmonic distortion is lower than normal. It is generally -60dB below the fundamental. That’s impressive. Disregard the notch at 150Hz. That’s caused by a floor bounce in my lab. The Raven-TA is a very friendly load for power amplifiers. The lowest impedance is 7 Ω. Almost all modern day power amplifiers are capable of this. Even chip amps. The electrical phase is amazing. From 200Hz to 20kHz, it’s almost flat. Combine this with the impedance, the power amplifiers will not be stressed. I was surprised when I first auditioned the Raven-TA. It doesn’t sound like the Raven at all. Worse than that, it sounded like some background music in shopping malls. No definition. Just a mess of blur. Everything about it was wrong. It was that bad. After sleeping over it, it dawned on me that perhaps the ferrofluid in the H26TG45 is the culprit. Maybe it’s over-damping the diaphragm. I proceeded to dis-assemble the H26TG45 tweeter and managed to remove all the ferrofluid. Re-assembled it back and what do you know, the speaker came alive. Now, the Raven-TA sounds the way I like my speakers to be. Vocals project out of the speakers, not recessed into the background. The treble has just the right amount of sparkle and at the lower end, it has a punchy mid-bass that the RS180s excels in. It has been a long journey with this Dayton RS180s. I bought it in 2010 but have never been satisfied with all my designs using it. Somehow, there’s always something that’s not right. It has taken me 7 long years to get a speaker with this RS180s that I can embrace wholeheartedly. Perseverance is indeed a virtue.